SP leader Azam Khan has issued a clarification statement over his remarks allegedly against Jaya Prada. Azam Khan said if anyone proves him guilty, he will step back and will not contest the Lok Sabha elections 2019. 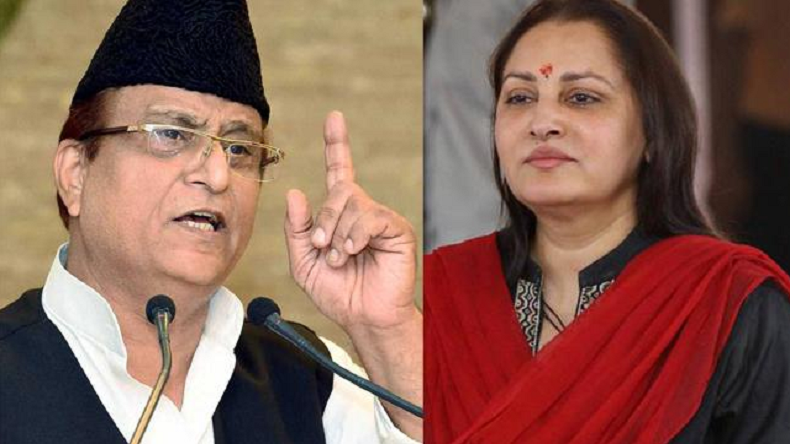 An FIR has been lodged against senior Samajwadi Party leader and candidates for the upcoming Lok Sabha elections from Uttar Pradesh’s Rampur, Azam Khan on Monday for his disgraced remark allegedly against BJP leader Jaya Prada. While Azam Khan has also clarified that her recent remarks were not for actor turned politician and BJP candidate Jaya Prada. Azam Khan said that if anyone proves him guilty, he won’t contest the Lok Sabha elections 2019. During a rally in Rampur, Azam Khan reportedly had said, without taking any name, that he brought her to Rampur. People are the witness that he did not allow anyone to touch her body. It took people 17 years to identify her real face but he got to know her in 17 days that she wears khaki underw**r.
Today, talking to the media, Azam Khan claimed that he didn’t mean Jaya Prada at all. He added that he won’t contest polls if proven guilty. His statement has also drawn the attention of the National Commission for Women. The NCW has found his remark disgraceful and had said that it will serve a show-cause notice to Azam Khan. While National Commission of Women chief Rekha Sharma said it was absolutely disgraceful. She said that Khan is always abusive and disrespectful towards women. BJP also termed Azam Khan’s remarks as disgusting and embarrassing and a new low in Indian politics. The reports claim that he was targetting Jaya Prada as she was a part of Samajwadi Party earlier and has switched to BJP recently. Azam Khan said, he became MLA for 9-times from Rampur and been a minister in the erstwhile government. He knows what to say and what not. If anyone proves that he named Jaya Prada or anyone, he will step back from the elections. Both the heavyweight leaders have a huge following and support and are contesting against each other from Rampur. The constituency will witness polling on April 23 in the 3rd phase of the Lok Sabha elections 2019. Jaya Prada, the actor turned politician entered politics in 1994 after joining Telugu Desam Party (TDP). The 56-year-old actress later joined Mulayam Singh Yadav’s Samajwadi Party. She was supported by veteran leader Amar Singh and contested the 2014 Lok Sabha elections from Bijnor seat but faced a defeat against BJP candidate Kunwar Bhartendra.